While predominantly rural, in recent years Carroll County in Maryland has become increasingly suburban. Located within the Piedmont Plateau region, with its characteristic rolling hills and lush forests, this historical community’s water and wastewater facilities are maintained by the Bureau of Utilities. The Bureau operates and maintains a 0.9 mgd wastewater treatment plant in Hampstead, along with 35 miles of collection lines including seven sewer pumping stations. 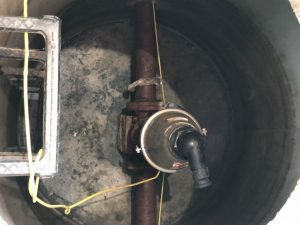 In the Freedom District, the Bureau is accountable for the entire collection system (98 miles), which includes 11 major sewer pumping stations that feed the Maryland Environmental Services wastewater treatment plant1. Along one length of the Bureau of Utilities’ sanitary sewer force mains there are nine precast manholes. The manholes, measuring 48” in diameter by 7’ average deep, were in fair condition. But as with most aging municipalities, they required regular attention and rehabilitation in order to eliminate inflow and infiltration (I&I) through their leaking joints. This was a burden on infrastructure and taxpayers alike. The Bureau decided to seek a longer-term solution. Having been in the industry for over 50 years, Pleasants Construction, Inc., a Maryland based company, was well equipped to handle this project. Their Underground Rehabilitation Services division offers manhole and structure rehabilitation as one of their many services. A careful analysis of these nine manhole structures led to a straightforward product selection. 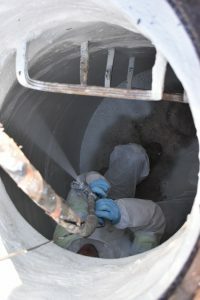 Epoxytec, a manufacturer of epoxies and protective coatings, has been recommending its CPP product for manhole rehabilitation since the early 1990s. This 100% solids, high-build epoxy paste is blended with fiber reinforced polymers (FRPs), providing high strength with flexural properties. Its unique properties include moisture tolerance and indefinite recoat window. The freeze–thaw tolerance is an especially attractive property in locations subject to large variations in temperature. Pleasants Construction is well versed in the capabilities and functionality of Epoxytec’s CPP. As a Preferred Epoxytec Sprayliner Certified Applicator, the company offers an advanced spray option. CPP was previously available only in trowelable form, but Pleasants has the proper heated plural-component equipment and skills to spray it instead. CPP Sprayliner offers all the benefits of this proven product, and the spray system for manhole rehabilitation simplifies the process, with improved ease of application. 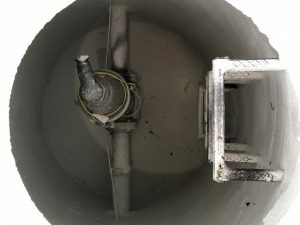 The unique features of a trowel-on or spray-on FRP, such as Epoxytec provides with its CPP series, provide specific benefits to the rehabilitation and lining of underground structures. This is especially true for structures that have deteriorated, are hard to reach, and are in need of a structural-grade solution, such as a reinforcement liner, but without the complications of traditional FRP that would be difficult to apply in logistically challenging areas. FRP technology comprises advanced polymers that deliver a hybrid structural-grade epoxy lining, with a reinforcement package of proprietary fillers. These fillers represent the latest advances in material science, using cutting-edge reinforcement agents such as synthetic fibers, ceramics, and polymer network chains to form a reinforcement network. Epoxytec’s FRP is different than traditional fabric-resin impregnated FRP. Rather, the system is an applied FRP, bonded epoxy which is first liquefied, then heated, pumped, and spray-applied direct to concrete (DTC). When mixed and applied, the system delivers a highly thixotropic, ultra-high build reinforced epoxy that exhibits high mechanical strength. When cured, its mechanical properties result in impressive flexural strengths, and tensile properties required for structural calculations, enhancement or reinstatement. Furthermore, the CPP series is not only a high-build lining system that can be applied directly to the substrate with high strength. It also comes with the advantages of high bond strength designed to seal against I&I, and incredible chemical resistance, designed to withstand the highest levels of H2S. It was the perfect choice for this Carroll County manhole project. Logistics played a part in the application. The manholes are located at the edge of a country road. Traffic control and lane closure procedures were put in place before work started. Before the essential surface preparation phase, Pleasants Construction had to deal with 2–3’ of accumulated liquid at the bottom of each manhole. A vac truck was brought to site to pump it out. Next came protection work. The manholes had 4” cast iron pipes running through them and some also had air release valves. These were all covered, for protection during spraying. Surface preparation typically involves high-pressure water cleaning (HP WC), or sometimes low-pressure, high volume water cleaning, to meet the standards of SSPC-SP13 / NACE 6, Surface Preparation of Concrete. This ensures a sound and pH-neutral concrete before the coating is applied. 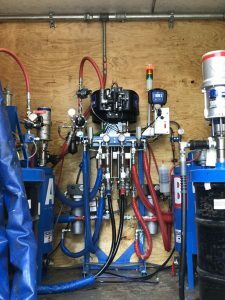 This is a routine but essential step before any coating application; the thoroughness of the cleaning will dictate the success of the application. The Pleasants crew used pressure washing to achieve a clean, sound, and profiled concrete. CPP Sprayliner has no VOCs, and is 100% solids. The product could then be applied, using an Epoxytec CPP Sprayliner rig. This is a system with recirculating and agitating hoppers heated up to 160 degrees Fahrenheit. Materials flow through separate (part A and part B) continuously heated hoses. Mixing occurs in a static chamber upstream of a single whip hose. The system has a fixed ratio of 1:1 by volume, with a minimum 25 gallons of preheating holding capacity for each part of the material. This structural product was sprayed to achieve a thickness of 100mils. 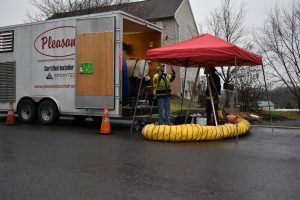 Expertly applied by Pleasants Construction’s four-man crew, the entire application to all nine manholes took five days. The successful application and completion of this project by Pleasants Construction will eliminate I&I from these manholes, thus obviating the costly routine maintenance that was previously required. CPP Sprayliner will protect these manholes for decades to come, rehabilitating and protecting this infrastructure at the same time.